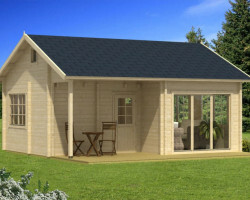 If you are the happy owner of large garden, you may consider buying a large garden summer house. 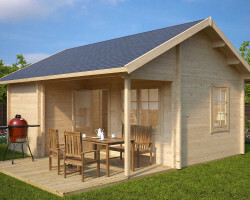 Most of our large log cabins have been designed to be very spacious hobby rooms, guest houses or even weekend homes for smaller families. 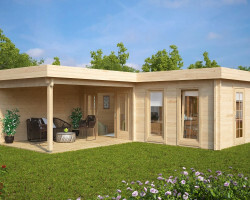 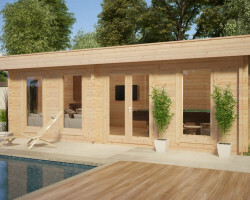 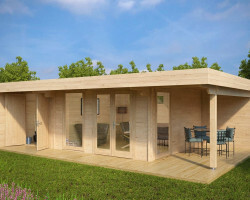 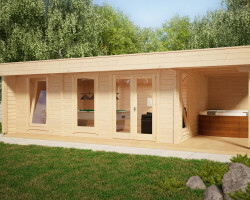 One of our newest products in this category is a Garden Gym and SPA Center Karina, with large workout room and sauna. 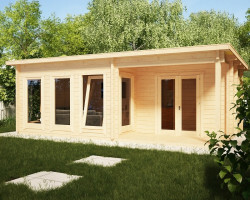 These wooden buildings demand a proper concrete foundation and are preferably installed by using professionals. 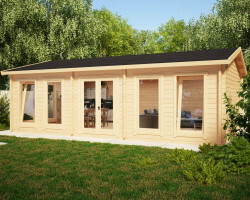 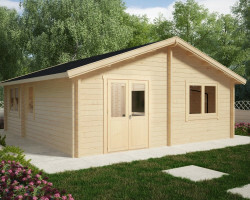 Wooden garden rooms over 20 m² could accommodate several hobbies under one roof. 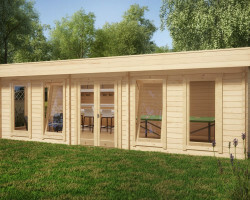 You can set up spacious hobby room in your garden for fitness training, billiards and a pool, table tennis or combine several activities you love. 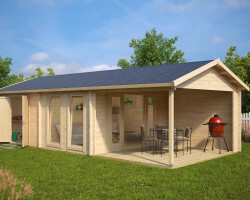 By spending a little extra, you can order a wooden terrace for your garden room to have an extra space for BBQ grill and outdoor furniture. 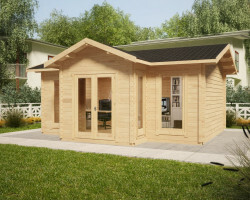 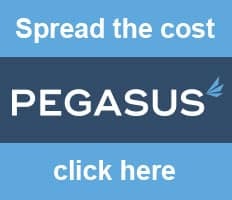 Just write us your desired size and we will happy to come up with our best possible offer. 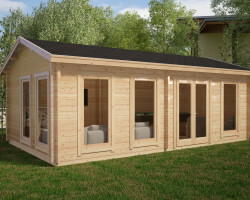 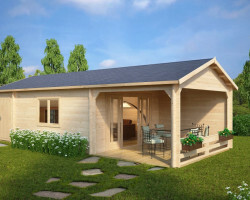 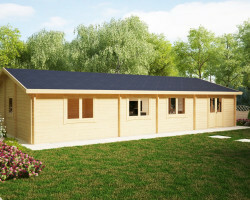 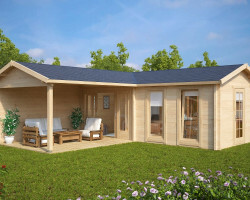 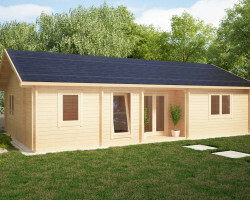 Large summer houses for gardens are supplied with 50-70 mm thick walls, 28 mm flooring, 18 mm roof boards, roofing felt, double glazing in windows, wind braces, assembly kit and very detailed assembly instructions. 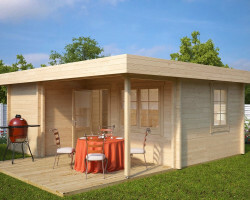 The average size is around 22-30 m². 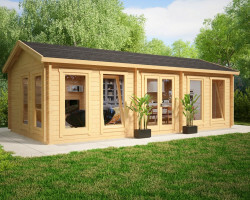 Many of large summer houses have an upper loft for extra sleeping places or for storage purposes. 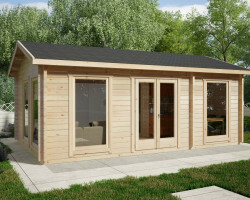 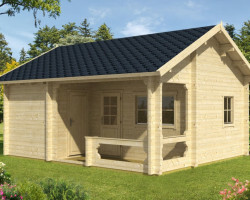 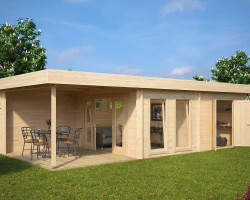 Large wooden cabins like all our other garden buildings are delivered on trucks with mounted moffets. 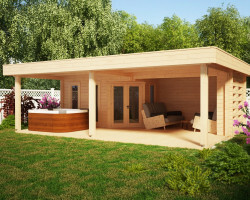 This intelligent way of delivery allows easy unloading of heavy packages from the truck and moving them to almost any place in your garden. 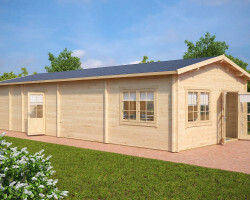 All flat pack log cabins are waterproof packed for shipping.